Lieutenant M Anjana recently achieved the rare distinction of being the first lady cadet to secure both Gold Medal and the coveted Sword of Honour in the combined course of Short Service Commission 99 and Short Service Commission (Women) 13 courses from the Indian Army’s Officer Training Academy (OTA), Chennai. The gold medal is received for the officer who is first in the over-all order of merit and Sword of Honour is given to the best all round cadet of the passing out course. The combined course comprised of 185 cadets of which 140 are Gentlemen Cadets and 39 are Lady Cadets and 6 foreign cadets and the curriculum has emphasis on both academics and physical fitness. 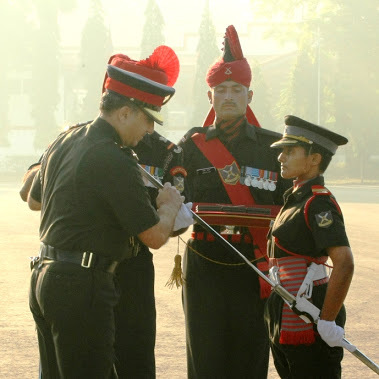 Captain Divya Ajith is the first lady cadet to get the Sword of Honour in the year 2010 during the passing out of SSC(W) 04. As a cadet, Lieutenant M Anjana, led the passing out parade at OTA on 14 March 15, and was also awarded a Commendation by Lieutenant General Sanjeev Madhok, General Officer Commanding-in-Chief, Army Training Command. The officer is a resident of Vashi, Navi Mumbai and competed schooling from Kendriya Vidyalaya Sanghatan. She has graduated from Government Law College, Mumbai with the outstanding student award in the final year. The Officer has joined the Judge Advocate General (JAG) branch and will proceed for her training attachment with Jammu and Kashmir Light Infantry at Shrinagar on completion of leave.